(2) Tanaka T, Hoshino Y, Miyaji N, Ibaragi K, Nishida K, Nishizawa Y, Araki D, Kanzaki N, Matsushita T, Kuroda R. The diagnostic reliability of the quantitative pivot-shift evaluation using an electromagnetic measurement system for anterior cruciate ligament deficiency was superior to those of the accelerometer and iPad image analysis. Knee Surg Sports Traumatol Arthrosc. 2018;26(9)2835-2840. (3) Matsushita T, Araki D, Hoshino Y, Oka S, Nishida K, Tanaka T, Miyaji N, Kanzaki N, Ibaraki K, Matsumoto T, Kurosaka M, Kuroda R. Analysis of Graft Length Change Patterns in Medial Patellofemoral Ligament Reconstruction via a Fluoroscopic Guidance Method. Am J Sports Med. 2018;46(5):1150-1157. (4) Nishida K, Matsushita T, Takayama K, Tanaka T, Miyaji N, Ibaraki K, Araki D, Kanzaki N, Matsumoto T, Kuroda R. Intraperitoneal injection of the SIRT1 activator SRT1720 attenuates the progression of experimental osteoarthritis in mice. Bone Joint Res. 2018;7(3):252-262. (5) Kirizuki S, Matsumoto T, Ueha T, Uefuji A, Inokuchi T, Takayama K, Hashimoto S, Hayashi S, Matsushita T, Kuroda R. The Influence of Ruptured Scar Pattern on the Healing Potential of Anterior Cruciate Ligament Remnant Cells. Am J Sports Med. 2018;46(6):1382-1388. (6) Matsushita T, Nagai K, Araki D, Tanaka T, Matsumoto T, Nishida K, Kurosaka M, Kuroda R. Factors associated with the status of meniscal tears following meniscal repair concomitant with anterior cruciate ligament reconstruction. Connect Tissue Res. 2017;58(3-4):386-392. (7) Inokuchi T, Matsumoto T, Takayama K, Nakano N, Zhang S, Araki D, Matsushita T, Kuroda R. Influence of the Injury-to-Surgery Interval on the Healing Potential of Human Anterior Cruciate Ligament-Derived Cells. Am J Sports Med. 2017;45(6):1359-1369. (8) Matsushita T, Oka S, Araki D, Nishida K, Tanaka T, Kanzaki N, Nishida K, Kuroda R. Patient-based outcomes after medial patellofemoral ligament reconstruction. Int Orthop. 2017;41(6):1147-1153. (9) Matsushita T, Kuroda R, Nishizawa Y, Araki D, Hoshino Y, Nagai K, Matsumoto T, Kurosaka M. Clinical outcomes and biomechanical analysis of posterolateral bundle augmentation in patients with partial anterior cruciate ligament tears. Knee Surg Sports Traumatol Arthrosc. 2017;25(4):1279-1289. (10) Ueda Y, Matsushita T, Araki D, Kida A, Takiguchi K, Shibata Y, Ono K, Ono R, Matsumoto T, Takayama K, Sakai Y, Kurosaka M, Kuroda R. Factors affecting quadriceps strength recovery after anterior cruciate ligament reconstruction with hamstring autografts in athletes. Knee Surg Sports Traumatol Arthrosc. 2017;25(10):3213-3219. (11) Kuroda R, Nagai K, Matsushita T, Araki D, Matsumoto T, Takayama K, Kurosaka M. A new quantitative radiographic measurement of patella for patellar instability using the lateral plain radiograph: 'patellar width ratio'. Knee Surg Sports Traumatol Arthrosc. 2017;25(1):123-128. (12) Tsubosaka M, Matsushita T, Kuroda R, Matsumoto T, Kurosaka M. Pseudoaneurysm of the articular branch of the descending genicular artery following double-bundle anterior cruciate ligament reconstruction. Knee Surg Sports Traumatol Arthrosc. 2017;25(9):2721-2724. (13) Matsushita T, Watanabe S, Araki D, Matsumoto T, Takayama K, Kurosaka M, Kuroda R. High tibial osteotomy combined with cancellous bone graft and osteochondral autograft transplantation in a patient with massive osteochondral defects in the medial femoral condyle: A case report and literature review. J Orthop Surg. 2017;25(1):1-6. (14) Kamada K, Matsumoto T, Takayama K, Araki D, Hashimoto S, Hayashi S, Matsushita T, Kuroda R. Mobile Bearing Total Knee Arthroplasty for Valgus Knee Osteoarthritis with Permanent Patellar Dislocation: A Case Report and Review of the Literature. Case Rep Orthop.2017:1230412. (24) Ueda Y, Matsushita T, Araki D, Kida A, Takiguchi K, Shibata Y, Ono K, Ono R, Matsumoto T, Takayama K, Sakai Y, Kurosaka M, Kuroda R. Factors affecting quadriceps strength recovery after anterior cruciate ligament reconstruction with hamstring autografts in athletes. Knee Surg Sports Traumatol Arthrosc. 2016 Aug 23. 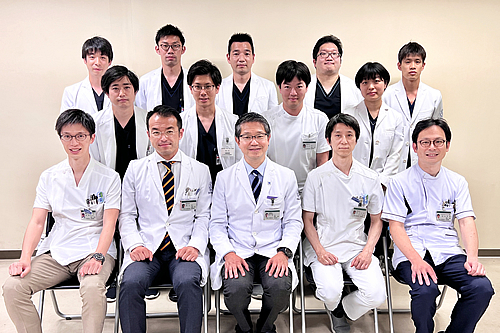 (45) Kanzaki N, Nishiyama T, Takakura Y, Takakura Y, Fujishiro T, Hayashi S, Hashimoto S, Kuroda R, Kurosaka M. Tibialis spastic varus foot without tarsal coalition: a report of two cases. J Orthop Sci 20(3):551-4, 2015. (55) Chinzei N, Kanzaki N, Takakura Y, Takakura Y, Toda A, Fujishiro T, Hayashi S, Hashimoto S, Kuroda R, Kurosaka M. Surgical management of the peroneus quartus muscle for bilateral ankle pain a case report. J Am Podiatr Med Assoc 105(1):85-91, 2015. (56) Kanzaki N, Nishiyama T, Fujishiro T, Hayash S, Hashimoto S, Kuroda R, Kurosaka M. Flexible hinge silicone implant with or without titanium grommets for arthroplasty of the first metatarsophalangeal joint. J Orthop Surg 22(1):42-5, 2014.